Many unsung heroes of the country who have dedicated their lives to serve the poor, worked for the protection of environment, spread education, and others, have been honoured with Padma Shri this year. For the last two years, the Modi government has been honouring unsung heroes with the Padma Shri award to recognise people who have dedicated their lives working for the poor, or have have survived difficult upbringings and progressed in their own fields. This year was no different as many luminaries were honoured with the fourth highest civilian award of the country. Rajkumari Devi , a 63-year old woman from Bihar, popularly known as ‘Kisan Chachi’ (farmer aunt) who hails from Anandpur village in Muzaffarpur district has been an awardee of Padma Shri this year. Defeating all the odds she faced in her married life, Rajkumari Devi is an inspiration to all those rural women who succumb to their atrocities. After leaving her husband’s home, she started farming using scientific methods. She later made pickle and marmalade and started selling them on a bicycle. Always wanting to enlighten and empower others, Devi spoke to the other women in the neighbourhood and inspired them to start working as well. She not only motivated them but also started several Self-Help Groups (SHGs) in her locality with the intention of making women independent. Now, around two hundred and fifty women sell pickle with her, and those products even sell abroad. Another awardee of the prestigious award, Jamuna Tudu, an environmental activist who is also known as ‘Lady Tarzan’ for taking on the Timber mafias and Naxals in the district of Jharkhand. Tudu is also the founder of Van Suraksha Samiti which prevents illegal cutting down of trees near her village in Jharkhand. Tea seller Devaralli Prakash Rao, another awardee of Padma Shri, begs to differ from the regular tea vendors. What is unique about this tea vendor is the fact that he has been imparting education among eighty children from the earnings he makes as a tea vendor. He wakes up early and runs the stall till late night and also runs a school for poor children despite being frugal himself. 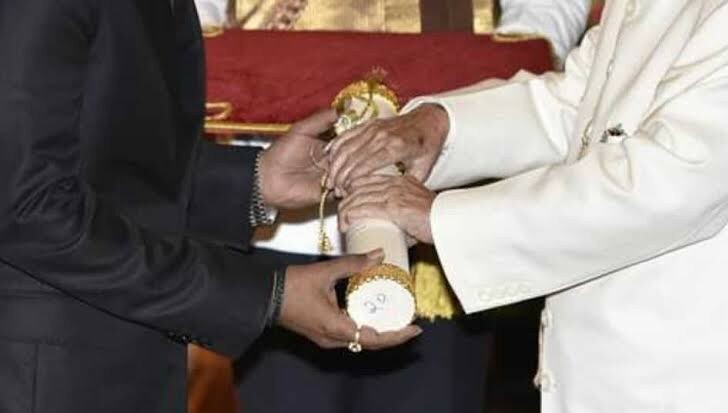 Another awardee is the 84 year old Shyama Prasad Mukherjee, also known as the ‘Poor Man’s Doctor’, who does not rest and serves patients charging them a fee of INR 5 and often treats many poor for even free. Mukherjee has been treating people for the last fifty years and examines 40 patients a day. A villager from Odisha who single-handedly toiled to carve out a three-km-long canal to bring mountain water to irrigate 100 acres of land and a German who looks after 1,200 sick, old and injured cows in Mathura are also among the 112 people who are chosen by the government for the award.